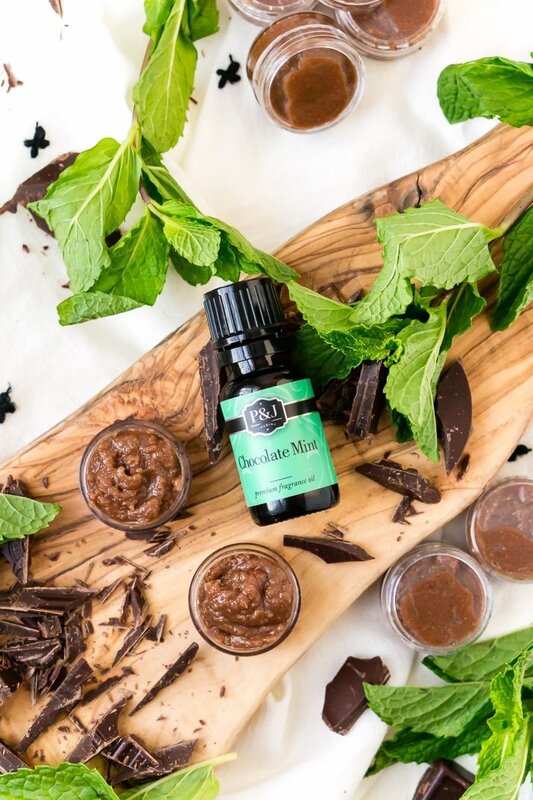 This Mint Chocolate Lip Scrub is an easy last-minute DIY holiday gift, it also makes a great favor for bridal and baby showers! Your lips will love you for this deliciously exfoliating recipe! Christmas is just around the corner, and in terms of gift-giving, it’s crunch time! If you’ve been buying presents, decorations, and tons of groceries, you may feel like you’re about to wear a hole right through your credit card. Maybe the thought of battling the mall crowds to pick up your last few gifts has you trembling in your boots. 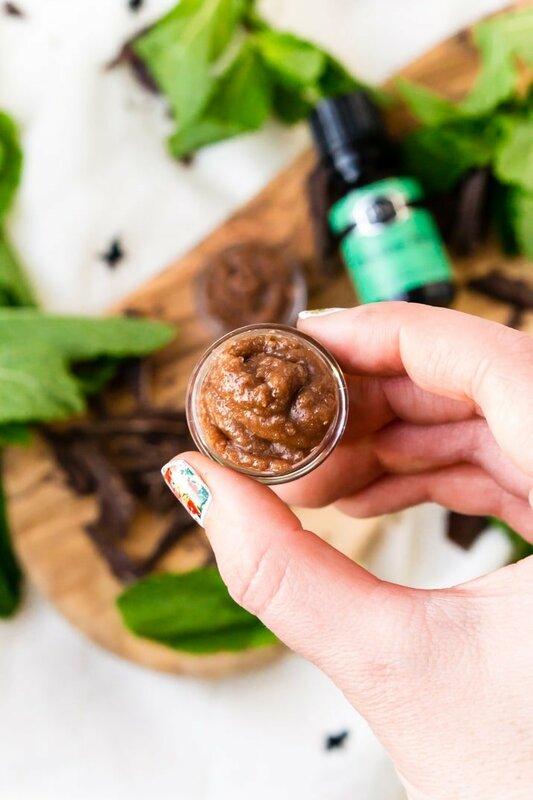 Well, I’ve got good news: you can whip up a batch of Mint Chocolate Lip Scrub for a last-minute gift that’s easy, affordable, and totally yummy! 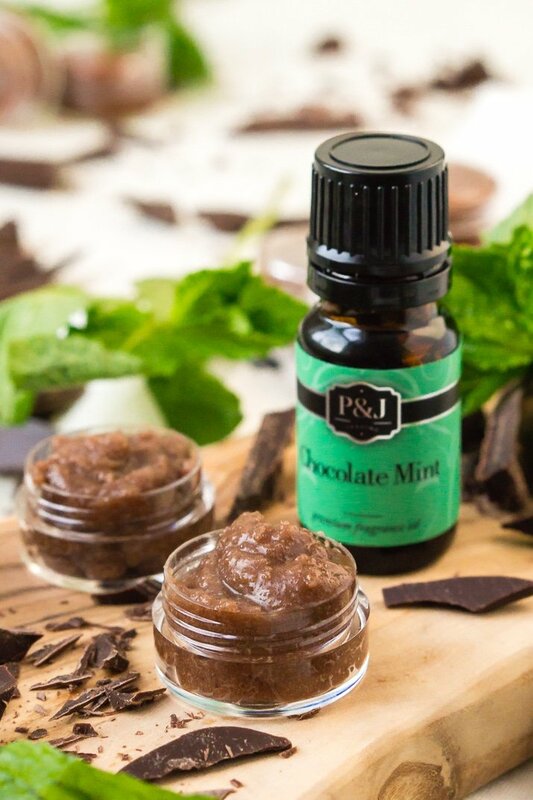 I love scooping a few spoonfuls of this Mint Chocolate Lip Scrub into portable screw-top containers or mini Mason jars. Adorn them with ribbon or twine, secure on a label, and voilà! You’ve got a perfect little gift to add to a homemade spa set or to stuff into stockings or to give to a friend alongside some delicious homemade fudge brownies! But your “Nice” list recipients won’t be the only ones enjoying smooth, kissable lips this season. After your first whiff, you’ll want to keep a jar of this scrumptious scrub nearby all winter long! 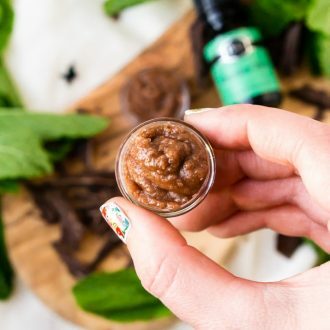 Just dab and rub a pea-sized blob of this Mint Chocolate Lip Scrub onto your lips, and they’ll be restored to their plump, natural glory. Not to mention, you’ll marvel at how smoothly you can apply lipstick over that freshly-buffed skin. 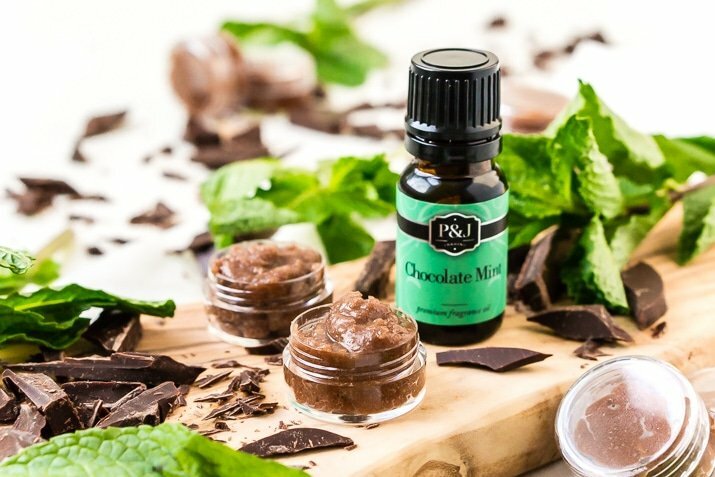 Homemade Mint Chocolate Lip Scrub makes a wonderful last-minute gift that also comes straight from your heart (and your kitchen!). Plus, it’s the tastiest way to show your lips some love this holiday season! Containers – If you’re giving this as a gift, you have to package it up in some little containers! Bakers Twine – To dress them up for holiday gift giving! Red & White Bakers TwineGet Recipe! Fragrance Oil – It’s what makes it smell so good and can’t be left out! Coconut Oil – There are many different types of coconut oil, you should use cold-pressed and unrefined coconut oil for this recipe. Combine sugars and coconut oil in the bowl of a stand mixer and beat with a paddle attachment until a fluffy paste starts to form. Scrape down sides and add in fragrance oil. Beat on medium speed for 1 minute or until light and fluffy. Transfer to a jar and seal with a lid. Dress it up if giving as a gift. Use within a month with hot water and gently exfoliate lips and rinse. Pin this Lip Scrub for Later! this sounds wonderful, but you will want to use essential oils, NOT fragrance oil. Fragrance oils should not be ingested, so it’s not a good idea to use it on lips. This is a lip scrub. It is not meant to be ingested.